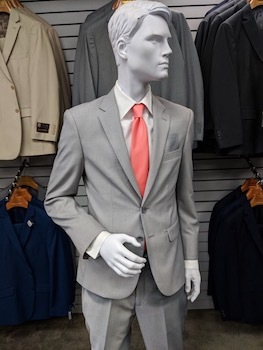 Caravelli or Fiorelli Suit Purchase from Top Hat Tuxedo! Valid at Top Hat Tuxedo in the Waterworks. This two-button suit is a stylish product and a staple for any man's wardrobe. It allows utmost in comfort as well as ease of movement. The suit has two besom front pockets and a besom chest pocket to store a wallet, keys, a cell phone and other necessary items. 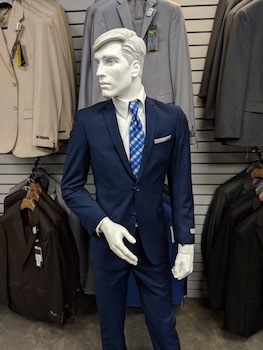 The outer part of the suit is made from viscose and micro poly and the inner part is 100 percent rayon for added softness. Top Hat Tuxedo, proudly serving the Pittsburgh area's formal wear and tailored clothing needs for the past 30 years! Valid for the purchase of a 2 piece suit by Caravelli or Fiorelli - Slim or Modern fit. Available sizes: 34S to 62L. Not valid on items already reserved or purchased.